*Tanks are an optional extra. 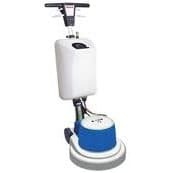 The Fiorentini Jolly polisher 17 is a reliable cleaning machine that is ideal for the maintenance of your floors in an industrial or commercial setting with the options of either polishing pads or scrubbing brushes. The Jolly Polisher 17 has the mid range scrubbing width of three polishers in this range.